The Small Pumi Foot File by Mr. Pumice is the perfect solution to get rid of calluses and achieve soft, healthy, smooth, beautiful feet. Featuring a medium grit, compact size, and an ergonomic handle, the Small Pumi Foot File is perfect for treating calluses, corns, and hardened skin for a soft, beautiful finish. 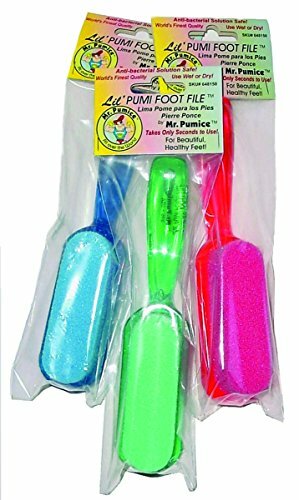 Inspired by the traditional pumice stone, Mr. Pumice is a pedi foot rasp that improves upon pumice with a synthetic frothed polyurethane material. Our custom formulation and European manufacturing produces a callus remover with uniform internal structure, unlike other materials (such as stone, glass, etc.) that might have holes, teardrops, and other structural flaws. It's also a sanitary solution, eroding naturally during use to prevent unsanitary buildup of skin cells in the material. Using the Small Pumi Foot File couldn't be simpler. Depending on your preferences, you can either use it dry, or you can wet the callused area of your skin with soap and warm water before use. Rub the bar around your toes and the soles of your feet to remove the calluses and tough epidermis. You can also use the bar on elbows and hands. Afterward, rinse the pumice file under hot water to clean it. Go to your local salon, and you'll find them using Mr. Pumice. An industry staple since 2000, Mr. Pumice is the #1 choice of professionals, trusted for its dependability, consistency, and quality. If you're looking for salon-quality treatment for healthy, beautiful feet, look no further than Mr. Pumice. Try it now! If you have any questions about this product by Mr. Pumice, contact us by completing and submitting the form below. If you are looking for a specif part number, please include it with your message.